This year’s Alumni Cabaret will be happening on December 26th 2015 at 6:00pm! Like last year, the show will be a revue/cabaret showcasing the music and talents of former Lofties. If you are interested in performing and have an idea of what you would like to do, please contact Alex Berger at aberger@theloftstage.org for more details. We will be rehearsing during the day and it is sure to be a great time! Even if you are unable to perform, we hope that you can join us that evening. Grads and Grown-ups Volunteer Appreciation! Immediately following the Alumni Cabaret, the boosters will be hosting a volunteer appreciation reception for grads and other adults who have volunteered with our program. More details later but plan to join us for a chance to say thanks for your continued contributions to the program. 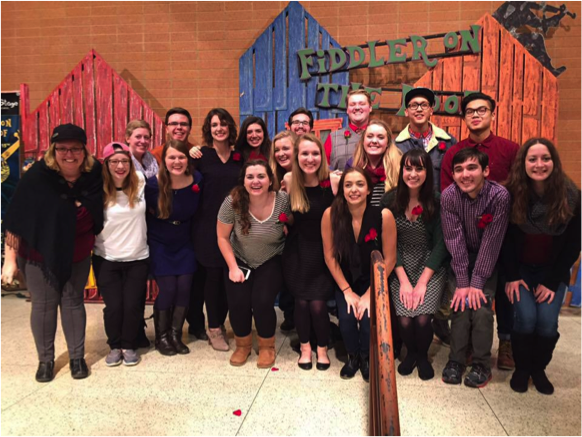 Thank you to everyone who came out to support the program at this month’s performances of Fiddler on the Roof! We had over 30 alumni attend over the two weekends, with many attending multiple times. It was great to catch up with so many people at the performances! This year, the Loft Stage’s winter play features “An Evening with Shakespeare.” They will be putting on abridged versions of two of Shakespeare’s classic comedies, The Comedy of Errors and Twelfth Night. One of these plays will be enter into the MSHSL one-act play competition. Performances will take place on February 6-7. Feel free to stop in the shop throughout January to help out! The Loft Stage has implemented an alumni board this year, which features former Lofties from many of East Ridge’s graduating classes. The Board President is Alex Berger and the members include Kajsa Jones (2011), Joe Johnson (2012), Ben Gotz (2012), Katherine Spicuzza (2014), Ryan Richardson (2014), Abby Winston (2015), and Anna Reimann (2015). Our goal is to maintain the connection between The Loft Stage and all of our wonderful alumni through the newsletter, annual cabaret, and other social events. If you have any interest in participating in any way or have any questions about anything related to the Loft Stage, feel free to contact any of us. We would love to have every graduating class represented, so if you graduated in 2013 and are so inclined, we’d love to have you on board! Remember to check the Alumni Facebook Page! The Loft Stage Alumni Facebook page is not only a great place to stay connected (it has been wonderful reading all of the posts lately) but is also a great place for information. Be sure to check the Facebook page for any upcoming events, volunteer opportunities, and much, much more! We hope to see you all for the Alumni Cabaret on December 26th.